TWhat is the "Millennium City?" At first, I would like to talk about what the "Millennium City” is. The Millennium City, in a word, is an activity that “building and living in an ideal city where citizens can develop their community based on their own ecological concepts.” About seven years ago, some volunteers gathered and made a Japanese NPO which is the Millennium City. Now it has been become a citizen organization which has about 250 members (about 50 directors) and other people from different jobs and positions. The community’s money --"Mille" has been floated. There are two purposes of the Millennium City in briefly. One is "Global Environmental Restoration ", and the other is that creating and developing the “connections between people". Both of these two purposes are to restore what have been lost from the pursuit of the evils of competitive society and short-term profits. 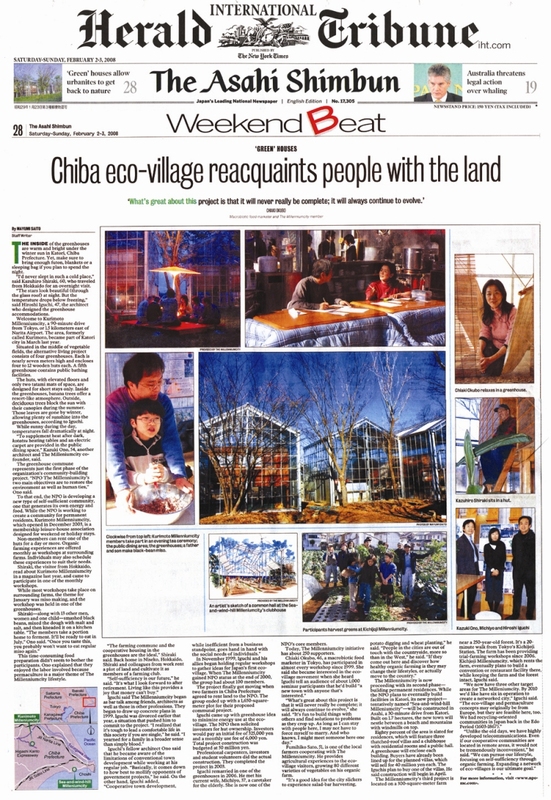 Specifically, building ecological theme towns in different places such as sea, mountains, cities, farms, and ranches, and then connecting them in the network. Through the process, we hope to achieve the two purposes that creating and developing the "Global Environmental Restoration "and “Connections between People". The paradigm shift- Making the mind soft. We have been pursuing the happiness and the affluent society and economy. However, the result of putting value on economy and the material has become a global-scale environmental destruction and various problems of human's heart to us. The values we have thought to be important up to now are centered on money and time. Through changing the values, the world with the rule of nature and a rich heart can be made. The millennium city is trying to cause the paradigm shift with the city as the theme. Specifically, the following three paradigm shifts are done. 1: Paradigm shift of "Money and time"
The community’s money --"Mille" has been floated. It aims at the life not used for money. 2: Paradigm shift of "City = forest = farmland"
The construction of modern city is that the special zone and the division of labor are fixed by the efficiency of the modern industry. The result of the construction makes the city, the forest, and the farmland become a single function and get into a sustainable situation. The millennium city is trying to develop a sustainable mixture system that city includes the forest and farmland. 3: Paradigm shift of "It is easy to make the city wholly". The one thing Japanese forgot in the modern society is that it is common to make our own life and environment through our own hands and live peacefully, isn’t it? The life and the environment that we hope can be made if we do seriously. It might be actually easy to make the city wholly. The millennium city is a self building city where the participants (citizens) make their desired environment by themselves. The workshop is made to look for participants, get agree through enough time while condensing the idea thoroughly. At the stage where the participants are able to agree, it shifts to a specific process. Self-building means that deciding and selecting the desired environment and design through your idea and decision. The photograph is a resort city named PORT GRIMAUD in south France. This city was build firstly in 1966, and then it has developed a city that has 3000 households as shown in the photograph about 20 years later. It was a surprise that the city was build through the hand of the citizens. There are a lot of other similar examples in Europe and America. The city is a good example that a city can be build by ourselves if we do it seriously. To change the previous consumptive society into the sustainable society, a new city image is proposed to revive the environment that has been destroyed. Then the city and the construction with environment and symbiosis are built. One example is a city image that realized as city=farmland =forest. House forest has been already achieved as a building unit. The millennium city aims at an independent city that provides for self-sufficiency of energy by use of natural energy and half self-sufficiency of food. It is an independent reciprocal help type that every house is kept the independence and different facilities (bathroom, dinging room, kitchen, child care room, and library, etc.) are shared. It is managed by the citizens. The citizen community can be developed through the process of centering with the citizen’s opinion and building the high satisfy facility environment. It is a type pf house which is built together and the desired housing can be bought by reasonable price. There is a possibility of regaining the connection of people's minds, but the effective communication is needed for the citizens at the collective house. The recognition connect housing that are constructing in various places are increasing, and they are connected on the network. The house can be exchanged living by freely, and the new living style is made. It is possible to choose the freedom of the living place or the sense of security of the place where someone known lives in surrounding even if where you live. Connected housing or aggregate becomes a theme town with different feature. Every theme town is connected through the network. The simple system is constructed in the network. For example, the people who like to live near the sea gather and build the sea theme town. The people who like to live in the mountain gather and build the mountain-forest theme town. The people who like to live in the city gather and build the city theme town. Various themes are possible. Then the theme town is connected through the network. It can be connected through the information and communication technology, It also can be achieved to make the possible system that living and exchanging freely in the network through using membership and community money like a subscription resort hotel. It was proposed for the next generation to mix the advantage of settlement and exchange living.